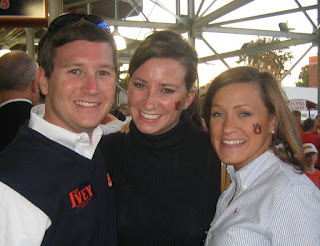 153 days until Auburn Football! 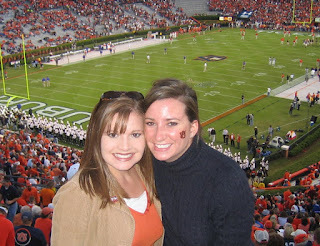 Living in Tennessee, it's hard to get to the games, but the ones I have been to have been awesome: 2006 LSU and FL, and 2007 Iron Bowl. All big games, all big victories! I am a good luck charm. Here are some of my favorite football memories! I haven't been able to see Auburn in person for two years. I think I've earned the free place to stay. I'm coming back to either LSU or Tennessee. I may come back for Georgia if I have enough time to take off a whole week for Thanksgiving. The whole finding a ticket process is so stressful. I hate it. I'm also opening the bidding for a free place to stay. I'll only charge you $20 to let me stay with you. Eric, I will talk to Jenn about tickets. Her family usually has some extra. Thanks Wes, you cheap whore. Eric -- prepare to fly to AU at the drop of a hat because the fam doesn't always decide who's going and who isn't until the last possible minute. BUT, there will be a record number of family members as students this fall, so things are looking good! 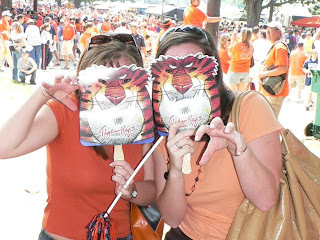 WDE to planning football events in March. I love Auburn. Um, what about, Lindsay, prepare to DRIVE to AU at the drop of a hat because the fam doesn't always decide who's going and who isn't until the last possible minute???? Thanks Jennifer. PS. Do you go by Jen(n)? I think you do. If so, do you prefer one or two "n's?" Yo' Mama needs a place to stay.I promise not to eat any bird eggs while there.